Old Men Dancing (OMD) was formed by musician and composer Michael Hermiston and emergency medical technician George Barron in 2002. The group consists of men aged fifty or so who have come together for the love of dance and performance. They have no formal dance training and come from all walks of life. Old Men Dancing is unique in the community and in Canada as a group that creates contemporary dance theatre in the context of what it means to be an older male in our society. The group challenges social norms, while they share and learn together. In 2005 they began working with choreographer Bill James, artistic director of Atlas Moves Watching, who offered weekly classes. The group has since commissioned and performed choreographic works by several contemporary choreographers including James, Allen Kaeja, Marie-Josée Chartier, Tedd Robinson, DA Hoskins and, most recently, David Earle. Here James, the choreographers and various group members comment on their experiences working with OMD. “I have always been fascinated by how people move in natural, unstudied ways. 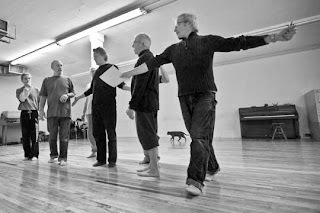 When I was a dancer with Le Groupe de la Place Royale in the 1970s and 1980s I taught theatre students at the National Theatre School, people in workshops on tour, adult beginner classes at our school in Ottawa. I also enjoyed all the instances where we engaged with the community in workshops, classes and residencies. Later on I developed a series projects to bring dance and other art forms to street-involved youth. While, as a choreographer, I love to work with highly trained dancers, I have always included people who are not trained dancers in much of my work. OMD has provided a trove of life experience. I am just beginning to realize how much they have to say as dancers. “I happened to have a work in mind for a really long time that I wanted to do with a group of mature men. When Bill asked me, I saw this as a great chance to experiment with the idea. For me the level of skill, the different body types, the different personalities was what made it exciting, and in fact fed me more ideas and possibilities than if I had worked with a more uniform group of professional dancers. “I prepare for making work in the same way with each new creation, as I do most of the work in the studio with the performers. I generally see what there is to work with and try to find the most interesting way to get the potential to reality. In the case of OMD I knew that I would work with props but did not know until the last minute whether it would be grapefruits or canvas squares. Basically, this is the same process for everyone that I work with; I come with nothing and find something or I come with something that I have used to see how I can go further with that concept. Because of the time constraints, I knew that I had to be extra clear about the movement from the start. The worst thing I could do would be to change my mind and head off in a different direction. I have also found through the years that no matter the experience of the performer, the first time that a sequence of instructions is transferred from choreographer to performer is the one most deeply ingrained, and Old Men Dancing was no different. “It is integral to absorb the distinction that defines each of my engagements - whether it be commissioned, collaborative or my own independent work. My main objective with this work was to explore aspects of age and innocence. That said, I had no idea how this would play out until we actually got into a room together to play, observe and respond to each other. “I was first invited to teach a partnering/contact workshop with OMD a year [prior to creating a work]. I didn’t know what to expect, but I found the men to be incredibly curious and willing to try anything. Their sensitivity and sense of self was most surprising. My goal in creating “Unhinged” was to investigate the journey from our perception of stoic, mature and armoured men, to that of vulnerable, caring and powerful yet compassionate men. “I joined back in 2003 out of curiosity. 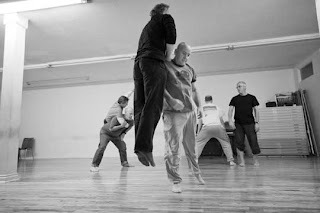 I like the creative process in general and the idea of a group of men getting together, frolicking, playing, experimenting and creating a performance piece sounded like fun, and it was. “I value the process of seeing something concrete created from nothing but intention and ideas. I value the respectful way that we as men support each other and that thus far “ego” for the most part has been absent from the process. 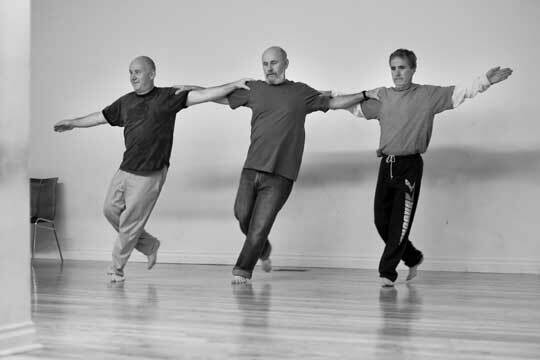 “I was hosting a dinner party at the Riverview Art Gallery when George Barron and Michael Hermiston asked if I would join with a group of old men to perform dance work. After the laughter subsided I said sure. “[I value] the camaraderie and the physical intimacy of creating dance together and the integrity and commitment of the members to dance and to contributing to our community and the world. “I attended the latest fundraising event at the Market Hall. I had one more beer than I usually drink, two instead of one. I should have said no but I said yes; then it was too much fun to quit. I have not raked the leaves nor cleaned the house yet this month due to rehearsals. “I work in IT; I thought IT users were the fastest to change their minds about what they want. Well, apparently I am still doing parts that were removed from the script the first day. Finally, I am getting what a “creative process” is all about. “I had never danced; didn’t know anything about it. I knew some of the men, friends, and had seen them dance. One day, one of them suggested I join. I had just gone through a rough period, had time on my hands and felt a need to challenge myself, get out of my head and do something that was really, really scary. So I did. 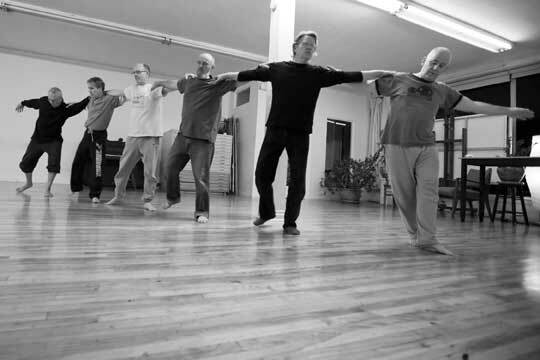 “Old Men is a very welcoming, open, supportive and fun group. We don’t take ourselves very seriously, but we work hard and want to learn and enjoy. The performance is secondary. I suspect if we never performed nobody would mind. It’s about getting together, exploring a process physically and experiencing the surprising elements that go along with that: learning about ourselves, caring, intimacy, beauty, movement, joy. “George Baron called me in the fall of 2001 and asked if I’d be interested in trying to do some dancing with a bunch of other old men. I thought this sounded interesting and at the time was looking for some avenue to explore creativity. Our first meeting as a group was at St. John’s church hall where Michael Hermiston, one of the co-founders with George, arranged for us to wash each others feet, which in one fell swoop challenged our stereotypes and the boundaries of traditional male relationships. The intimacy, openness and quirkiness of the experience had me hooked and excited at what seemed like endless possibilities. “I’ve always wanted to dance and to move. I’ve finally given myself permission to do as I please, everyone else be damned! It’s freeing and fun, and bloody hard work sometimes, but there’s always a huge payback in personal satisfaction when you’ve created something beautiful. “It seems that OMD has given me the opportunity to experience a beginning again, not knowing, having no skills in the area and allowing me the space to learn without being judged or compared. This was not true in my professional life. There was an expectation that I was perfect, had it together and so on, which was not true. In some ways I wore the veneer of a mask professionally whereas with OMD I am what I am, and playful at that, which was frowned upon in my professional world. “I joined OMD because of the name. It’s a verb, not a noun. I knew it would be cool. And I joined just when the big project with Bill James began last year. “My answer initially to the why (eight years ago) [I joined OMD] was that ‘ol men dancing’ in a local one-off performance piece sounded like it wouldn’t be a big commitment and it sounded like it could be a blast. Now the why is much different. It is a huge commitment (ten to fifteen hours a week for months on end) but it provides me with such a physical and creative outlet for expression of who I am, and who I want to be, that I cannot give it up. There are options to be in fewer pieces (to not work with each choreographer) but each one (Bill, Marie-Josée, Allen, Tedd and Darryl) provides such an incredible experience that it is hard to choose not to participate. I find myself now building my work and personal life around being available to dance. 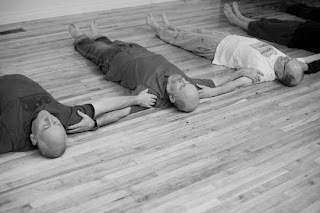 “Pete Hewett came to my house for dinner after the very first rehearsal of the Old Men Dancing with choreographer Michael Hermiston and described the foot washing ceremony they did. He said that they planned to do a piece for Emergency, Peterborough New Dance’s yearly local dance showcase. I was intrigued and said, ‘is it to late to get involved?’ I joined at the second rehearsal. Atlas Moves Watching presents Old Men Dancing in premieres by Tedd Robinson and David Earle, along with work by Bill James and Allen Kaeja from December 3rd through 5th at Market Hall Performing Arts Centre, Peterborough. OMD’s program Older and Still Gorgeous (Do Not Resuscitate), with choreography by Marie-Josée Chartier, DA Hoskins, Kaeja and James, runs March 26th and 27th, 2010 at the Enwave Theatre, Toronto.